Wood in the open air, whether at the carport, garden shed or shed, needs special protection. Only regular brushing will protect it from the weather. Wood is exposed to moisture and sunlight in the open air. Water makes it swell, it changes its dimensions and favors mold. The UV light of the sun changes the color of the wood, it turns gray or bluish. Only a regular coat of glazes or paints that are suitable for outdoor use will protect the wood from this damage. In the past, wood preservation often contained insecticides and heavy metals, in modern remedies are not highly toxic ingredients. These are generally superfluous, especially as roofs that are heavily exposed to the weather are additionally protected by roofing felt. Paint or glaze for garden shed & Co. Covering paints and varnishes require a primer coat. They sit on the surface of the wood and tend to peel off. Only highly elastic paints for wood last for a long time. 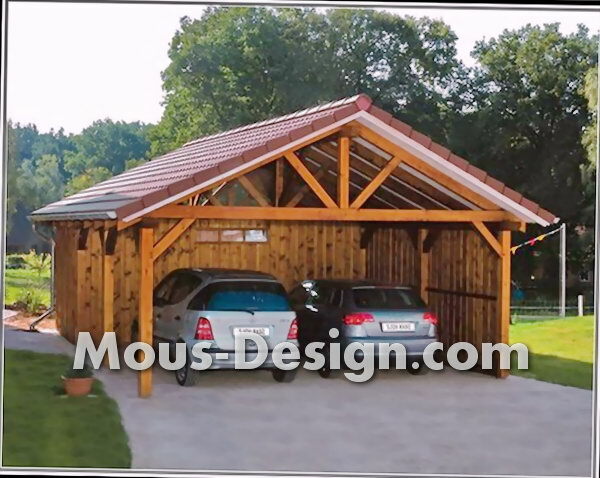 Glazes penetrate deeply into the wood and protect the carport or scales better. For components that are not dimensionally stable, such as wall boards of a tool shed, thin-layer glazes that do not form a film are sufficient. However, they offer little protection against moisture. For shutters, medium-layer glazes are suitable. When it comes to windows or doors, thick-film glazes must be used. They do not penetrate as deeply as the low-viscosity agents, but protect against moisture. These products form a water-impermeable layer on the wood. The cost of the material is limited. Thick layer glaze costs per square meter surface of the object one to two euros. If a specialist takes over the work, he estimates the same amount for preparation and painting. The wood must be clean and free of old paint. Coarse dirt can be swept off with a heavy broom. Sandpaper and steel wool are needed for further preparation. A grinder is only partially suitable for a garden shed - to remove color residues of tongue and groove boards, manual work is required. This also applies to windows and doors. In general, the wearing of protective mask and goggles is important in the work, because fine particles can get into the lungs and eyes. Beware of old paints: The grinding dust can be toxic under certain circumstances. Here, it makes sense to commission a professional with the preliminary work. Finally, all areas have to be thoroughly dusted again before they can be masked. The more carefully this is done, the cleaner the final result. Tip: Also protect the floor with cardboard or paper. Carport construction: what does it cost? On a dry day, the time has come - the painting can begin. Be sure to avoid working in the blazing sun. The paint dries too fast in this case and does not feed properly. A paint roller is a good tool to evenly coat large surfaces. However, it does not help when applying glazes or when it comes to windows or tongue and groove boards. Special soft glaze brushes are required for these wood preservatives. The best sequence when painting : Start with window frames, shops and doors. Then grooves and finally the boards. Building bike shelter: what does it cost? These and many other questions we answer in the price radar around the subject of bicycle shelter. Build a slide: what does it cost ?